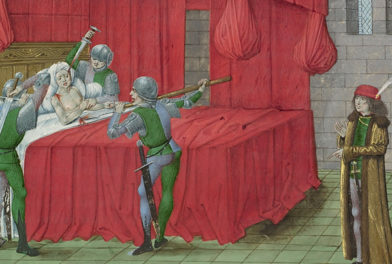 One of my favorite acquisitions of the past five years in the Getty’s manuscript collection is the Northumberland Bestiary (Ms. 100), featured currently in the Gothic Grandeur exhibition. A bestiary is a kind of medieval encyclopedia of animals. In addition to physical and behavioral descriptions, however, there is also commentary about each animal as a reflection of God’s divine plan for the world. The Northumberland Bestiary begins with a series of images depicting the Creation of the World, including, of course, the creation of the animals. 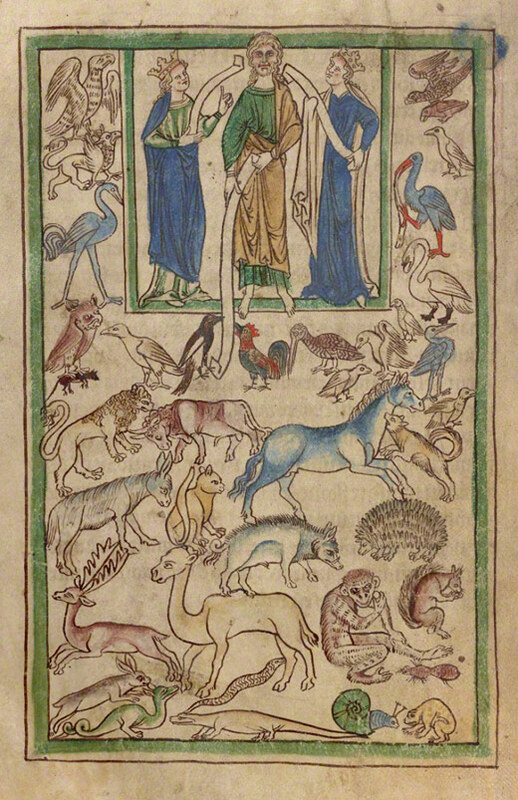 This image near the beginning of the manuscript shows the first man, Adam, presiding over a gathering of all the world’s beasts. At first the image looks like a jumble of animals—an eagle, a deer, a lion, a rooster, even a porcupine and a snail—all randomly scattered over the surface of the page. A closer look, however, reveals that the creatures are often paired: a foxlike animal bites the throat of a horse; a bird peers at an owl carrying a hapless mouse; a wild boar seems to launch itself from the back of a camel. These intricate details engage the viewer and indicate that the artist carefully planned and designed the page. Among all of the various encounters between the animals, however, only one creature directly engages the viewer, and unlike its charming companions on the page, this animal seems somehow sinister. 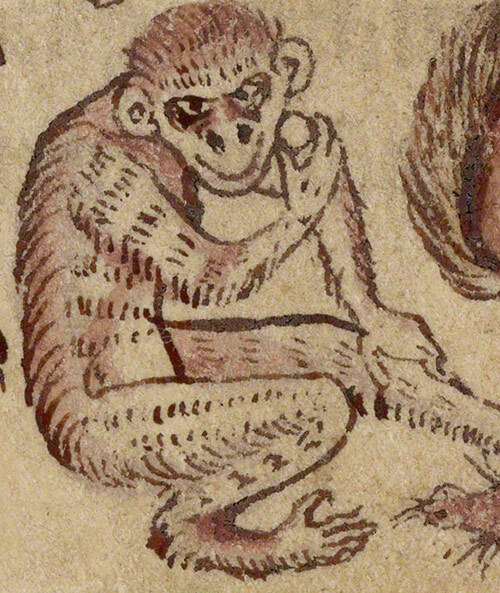 As with every beast featured in the bestiary, then, the ape serves as an animal symbol of some aspect of Christianity. On this page, only Adam and the ape gaze directly out of the image to meet the viewer’s eye—one the regal founder of the human race, and the other a degraded reflection of man, encompassing his evil possibilities. So interesting, reminds me of Umberto Eco’s ‘Name of the Rose’ and his wonderfully evocative descriptions. Wow, gotta say this monkey looks as creepy as the Joker in the Dark Knight. His eyes look all sunk in a shadowy, as if he hasn’t slept, dreaming of diabolical deeds that he can perpetrate. Wicked cool. I think the monkey is thinking as he is studying the object in his hand! My opion is the dog looking creature biting the horse is what the arist has seen! Same with the the owl and the rat or the bull charging! So I see a list of animals put together that he or she has seen and some of the actions he has witnessed! The bore is not on top of the camel the bore was drawn after the camel!